H/D exchange is a useful method to probe protein conformation and dynamics in solution. Exchange is initiated by dilution of a protein into a D2O buffer. Labile hydrogen atoms will exchange with deuterium. Each exchange event leads to a 1 Da increase in the mass of the protein. Hydrogens in carboxyl, hydroxyl, and amino groups exchange nearly instantaneously, but revert to hydrogen during analysis. Amide hydrogens exchange at rates that are characteristic of local backbone conformation and dynamics. In highly dynamic random coil regions, the exchange reaction proceeds rapidly while the rate can be many orders of magnitude slower in tightly structured regions. The degree of protection from exchange is indicative of local structure and flexibility. In the MS-based approach, the exchange reaction is quenched by acidification to pH ~2.5. Quenching is followed by rapid proteolysis (usually with pepsin) to produce short peptide segments, chromatographic separation, and mass analysis. 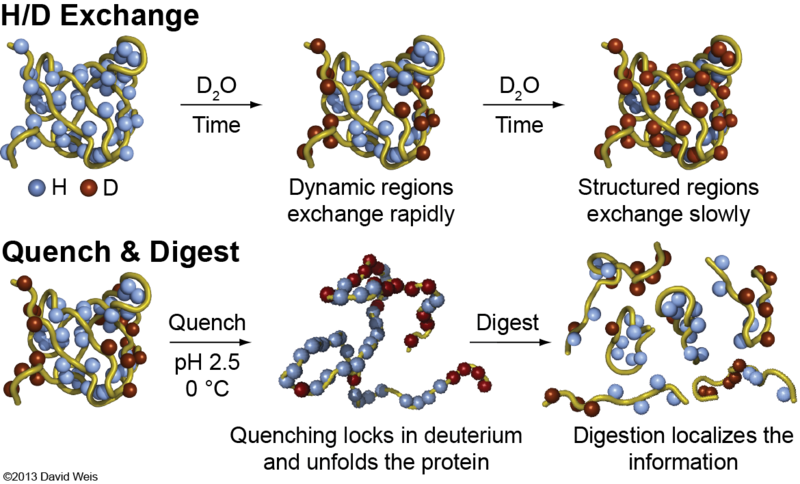 The quenching step serves to “freeze in” the pattern of deuteration imprinted on the protein under the deuterium labeling conditions. This allows read-out of deuterium uptake under non-physiologic conditions by MS.